Sir Thomas Wyatt (1503-1542) was a famous poet and ambassador at the court of Henry VIII. His father, Henry Wyatt, had been a member of Henry VII’s Privy Council, so it was natural that Thomas would follow in his father’s footsteps and join Henry VIII’s court. He is famous for his poetry, for introducing the sonnet into English literature and for being one of Anne Boleyn’s suitors, although it is now thought that his love for her was unrequited. In his poem “Whoso List to Hunt”, he writes about a deer (Anne) being hunted down (by Henry) and being out of Thomas’s reach because she says “Caesar’s I am”. Wyatt also wrote poetry about Anne Boleyn’s execution and the executions of the five men accused of committing adultery with her. He was imprisoned in the Tower of London during the coup against Anne Boleyn but escaped execution. Wyatt married Elizabeth Brooke in 1521 and the couple had a son, Thomas Wyatt the Younger, who was executed in Mary I’s reign for plotting a rebellion (Wyatt’s Rebellion) to depose the Queen and put Elizabeth on the throne. 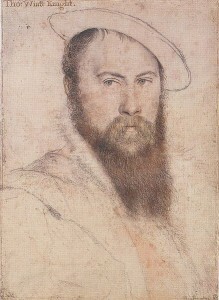 Thomas Wyatt died in 1542, aged 39, and never saw his poetry published.